Ramlochan's poems take the reader through a series of imaginative narratives that are at once emotionally familiar and compelling, even as the characters evoked and the happenings they describe are heavily symbolic. Her poems reference the language and structural patterns of the genres of fantasy or speculative fiction, though with her own distinctive features, including the presence of such folkloric Trinidadian figures as the Duenne, those wandering lost spirits whose feet point backwards. Her characters are variously described as "soldier", "thaumaturge", "surgeon" and much else, and her speakers live in a world that is located somewhere between the fantastic and the ordinary, everyday world of school buses, home chores and domesticity. In these poems, a woman is invariably the protagonist and Ramlochan is eloquent in her exploration of the ways in which gender has to be negotiated. They constantly challenge the stereotypes of the female. The female force that Ramlochan explores in her poems is creative and destructive, vulnerable and untameable. In poem after poem, the female assumes the elemental roles of both saviour and devil. There is, for instance a revision of the role of Eve and the gendering of a Blakean challenge to the false division between God and Satan, most famously realised in Milton's Paradise Lost. Here, Ramlochan finds great mythical possibilities in the figure of Lilith, a familiar feminist trope. Ramlochan's Lilith is at home in the Caribbean, and she enacts her powers within the context of the Caribbean spiritual realm. What is not referenced in the poems, but which one senses is part of their universe, is the Hindu world of undivided gods and goddesses, such as the creator/destroyer, Kali. 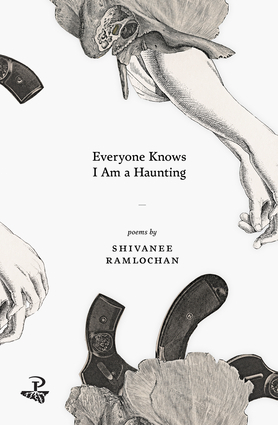 In Shivanee Ramlochan's first collection of poems, Trinidad and Caribbean poetry finds an exciting new voice, one that displays a sharp intelligence, and iconoclastic spirit and fertility of imagination. Shivanee Ramlochan's poetry has been published in tongues of the ocean and The Caribbean Review of Books, and is forthcoming in Small Axe: A Caribbean Journal of Criticism. She is an alumna of the 2010 Cropper Foundation Residential Workshop for Caribbean Writers. In 2013, she was selected as one of three New Talent Showcase writers at the NGC Bocas Lit Fest. Her poems received the second place prize in the 2014 Small Axe Literary Competition. In 2015, she was longlisted for the Hollick-Arvon Caribbean Writers Prize.